If you’re a retailer who isn’t making serious inroads in 2016 to tie assets, data and currently disparate channels then you are heading in the wrong direction. This is one takeaway from Steve Rowen of RSR Research who worked on a new benchmark report for NetSuite, “Commerce Convergence: Closing the Gap Between Online and In-Store.” The study reveals the challenges today’s retailers face when bridging the on- and offline experience. While this is the first year conducting the study (so there is no past data for comparison), savvy retailers may be surprised to know that the majority of their peers (71 percent) believe that only 25 percent of their overall sales will be influenced by digital shopping behaviors in the next three years - indicating their focus is too much on the store and not what's happening online. While a 2015 study from Deloitte found that 49 percent of brick-and-mortar sales are influenced by digital, one only has to look to their own shopping habits to know the significant role digital plays when buying products (e.g. mobile search, Pinterest boards, reviews, etc.). By not respecting digital’s prominent role, retailers risk missing out on opportunities to know who their customers are when they walk through the door, as well as what they had previously looked at online, their past in-store transactions and more - all to increase conversions, loyalty and customer satisfaction. While getting buy-in for new technology is always an issue, Rowen of RSR Research was personally surprised to learn retailers don’t know that the tech already exists to provide a seamless experience across channels. The report’s sponsor NetSuite, for example, provides SuiteCommerce InStore that shows retail associates a 360-degree view of the customer (like their wish lists, transactions and even online shopping carts) and company-wide inventory allowing them to personalize the in-store experience and even offer options like buy in-store and ship to home (or a gift recipient's home). It is these type of capabilities that many retailers find important (see graph below) but aren’t satisfied with their current execution. 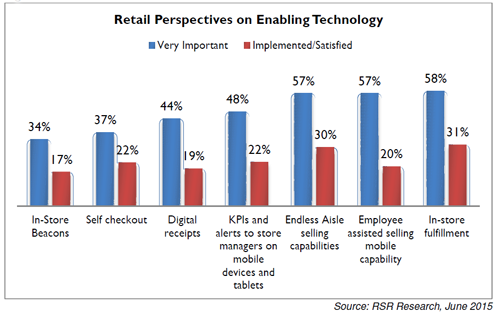 Even so, retailers have their own challenges of why providing a seamless experience seems out of reach – with “hard to quantify technology return on investment” having the most votes across organizational size. While everything is relative to staff size, revenue and more, it would blow the minds of most Web professionals to learn just how much technology retailers are managing day to day - using one enterprise resource planning (ERP) with another content management system (CMS) with another customer relationship management (CRM) solution and yet on top of another e-commerce platform. 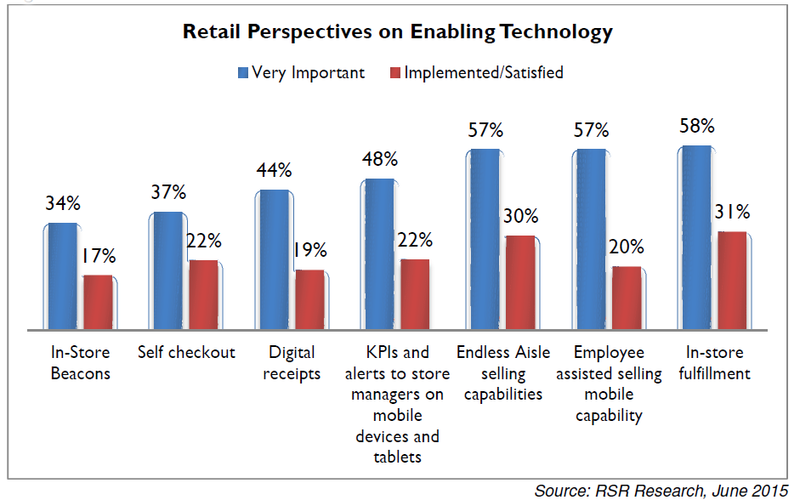 The report from RSR Research and NetSuite sheds light on retailers' desire to eliminate complexity in the hopes of gaining, "maximum visibility across inventory, orders, customers, and products" to "deliver robust capabilities like assisted selling and in-store fulfillment all in the simplest way possible." Further, it proves the future is now when it comes to recognizing and integrating the role digital plays in a shopper's purchase decisions.